When it comes to famous railway journeys, this trip has already allowed me to experience the world’s longest, the trans-Siberian from Moscow to Beijing. 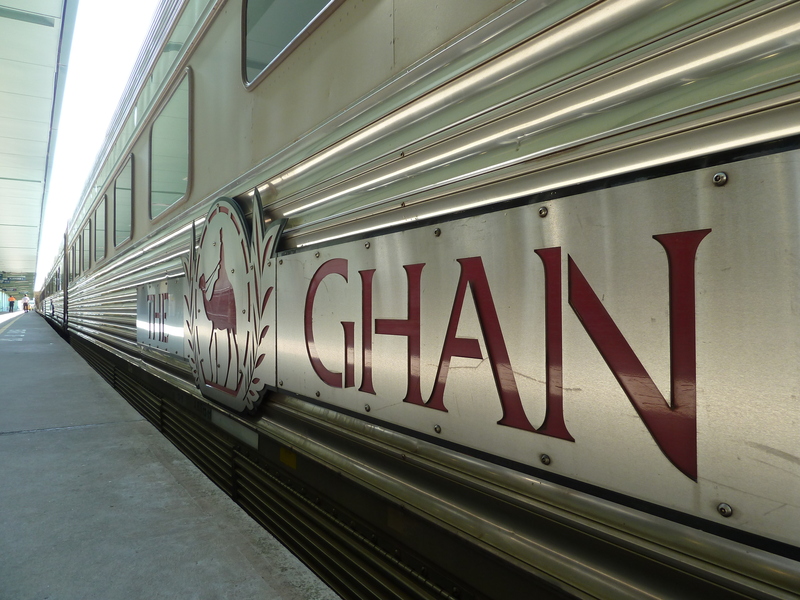 But for sheer wow factor, The Ghan must take the absolute crown. 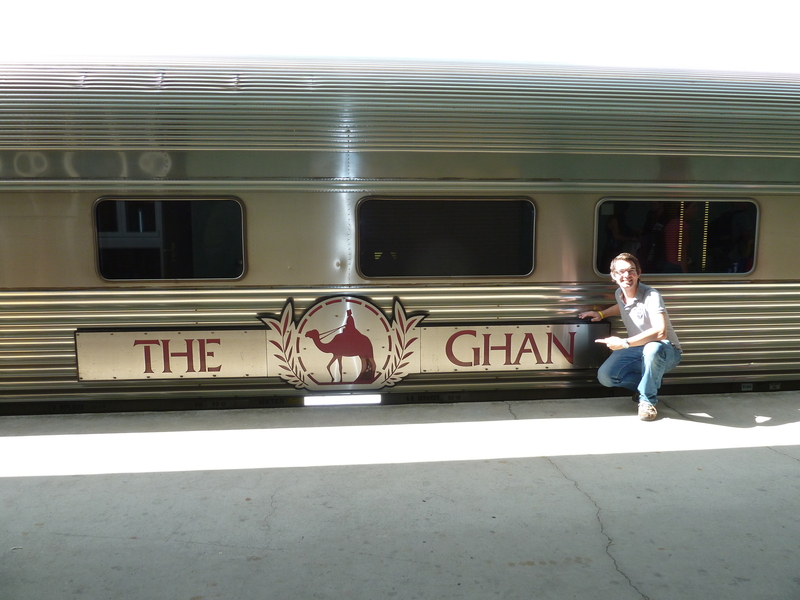 The train’s name honours the Afghan camel drivers, who set off years ago, long before engines, diesel and rail, to help find a way to reach Australia’s unexplored interior. 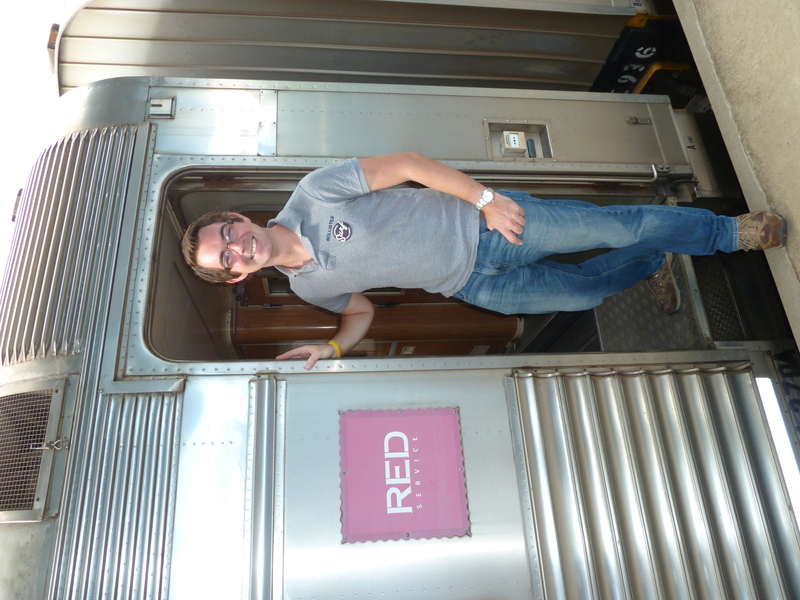 The honour is bestowed upon one of the finest trains you will find in the world. With 28 pristine carriages, it stretches back almost three quarters of a kilometre along Platform One at Adelaide’s Parkland Terminal. 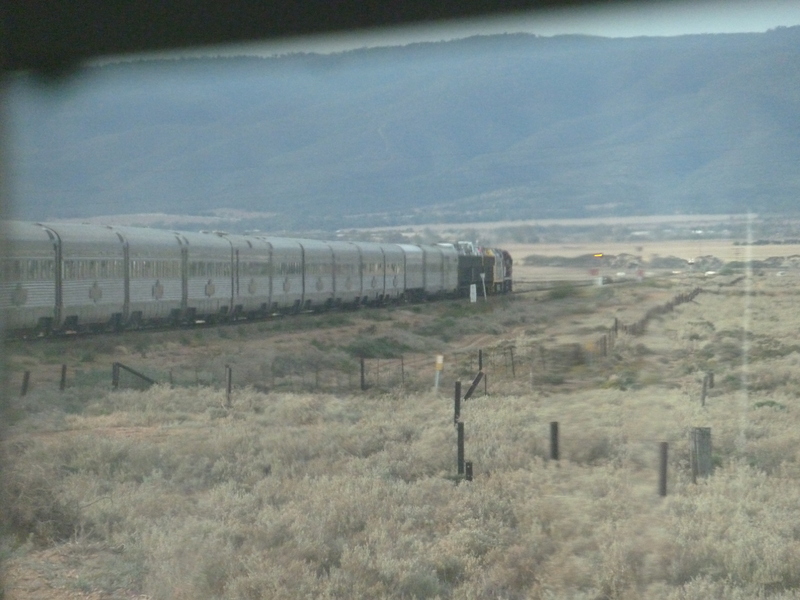 In front of me, 1,344 tonnes of pure rail journey heaven, its shiny silver consist glinting in the warm South Australian sun as I walk its entire length. At the front, its bright red powerful locomotive muscle, emblazoned with the famous Ghan camel insignia, waits for a green light and the signal to start hauling the behemoth through the iconic deserts of Australia’s red centre. You can feel the anticipation in the air as the crew and porters busily load hundreds of suitcases and bags onto the train. Ahead, a 54 hour marathon through some of Australia’s most inhospitable, baron and empty landscape, straight up through the centre to Alice Springs and on to the very north. A trans-continental adventure that clocks up just shy of 3,000km before it slows to a halt in Darwin, turns around, and does it all over again. 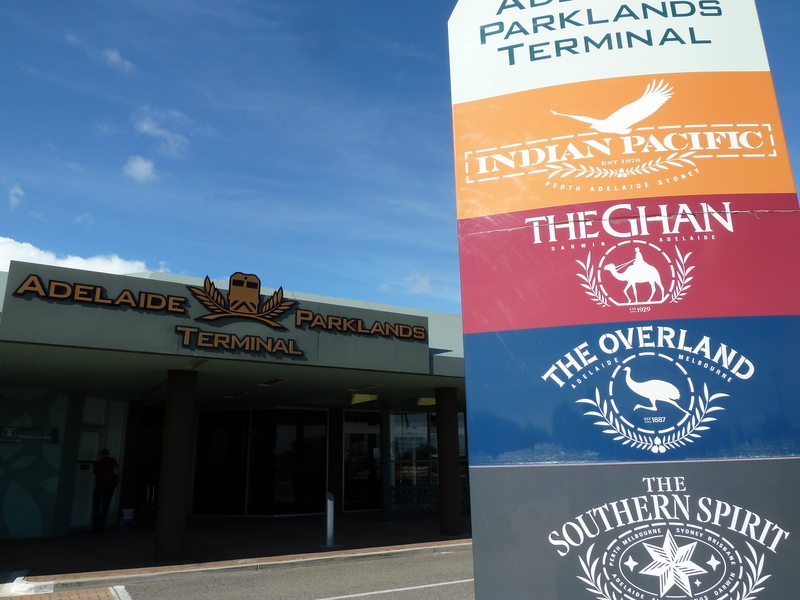 This station is no stranger to impressive railway feats – the Overland to Melbourne, the Southern Spirit to Brisbane and the awe-inspiring Indian Pacific, which takes passengers from the east coast to the west coast of this huge nation, all pass through Adelaide. Yet there was almost a feeling that this was the first time anyone had ever made this particular journey, a feeling of celebration, summed up by the welcome meeting from the crew by the train. “The party starts right here,” bellows one of the immaculately-dressed staff over the station tannoy. 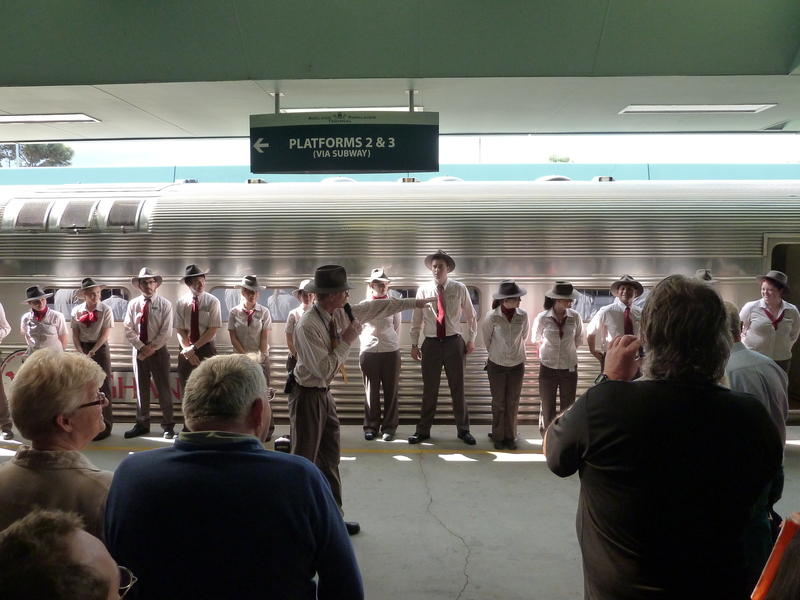 The train crew introduction show – you dont get this on Hull Trains! There then follows a brilliant run-down of who was who, who was in charge, who was at the controls and who would be reading the map on the way. There was a huge sense of fun mixed with pride – it was clear that everyone who lives and works onboard this incredible train loves every bit of it. “Alllll aboard,” was the simultaneous cry from the crew as they made their way to their respective carriages, a walk that can take some time. Hundreds of passengers and travellers dispersed along the platform, eagerly looking forward to stepping onboard and settling down. I met up with my two friends I met at the Backpack Oz hostel in Adelaide, Laura and Dan, both of whom have been travelling just a couple of weeks longer than me. They are in the Red section of the train, while I’m in the Red Kangaroo sleeper section, a couple of carriages in front of them, but they are both getting off at Alice Springs too. They have arms full of pillows and bags, but we all stop to take photos of each other. I’m in carriage N, berth 25, and we soon see the carriage label on the side of the train. 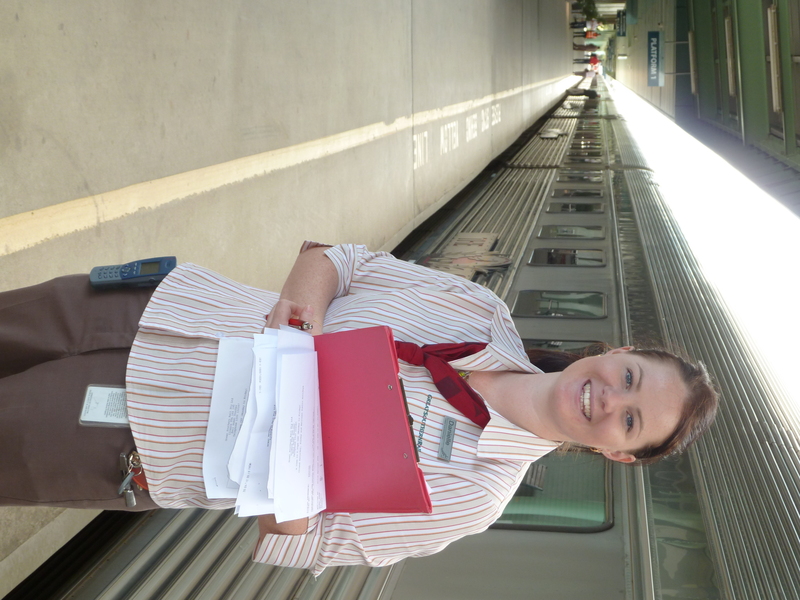 I am welcomed onboard by the carriage attendant, Danielle, who directs me to my room. “I’ll come and find you later on,” I say to my new friends as I step onboard, waving them off as they walk further down the platform. 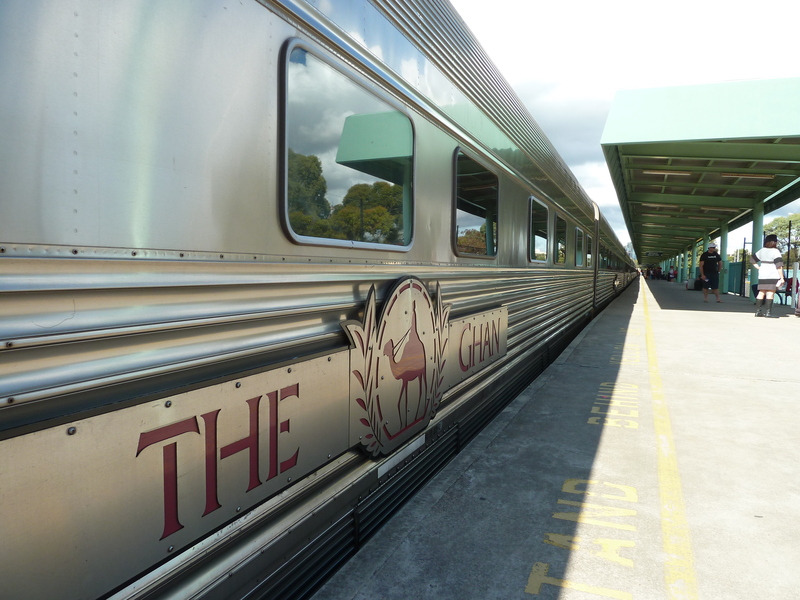 Inside, the beautifully furnished carriage swallows me, a sweeping, curving corridor through the centre winding its way past all the private cabins. Mine is towards the end of the carriage, the door already ajar to welcome me. I put my bags down onto the floor and take a minute to have a look around, and smile to myself. 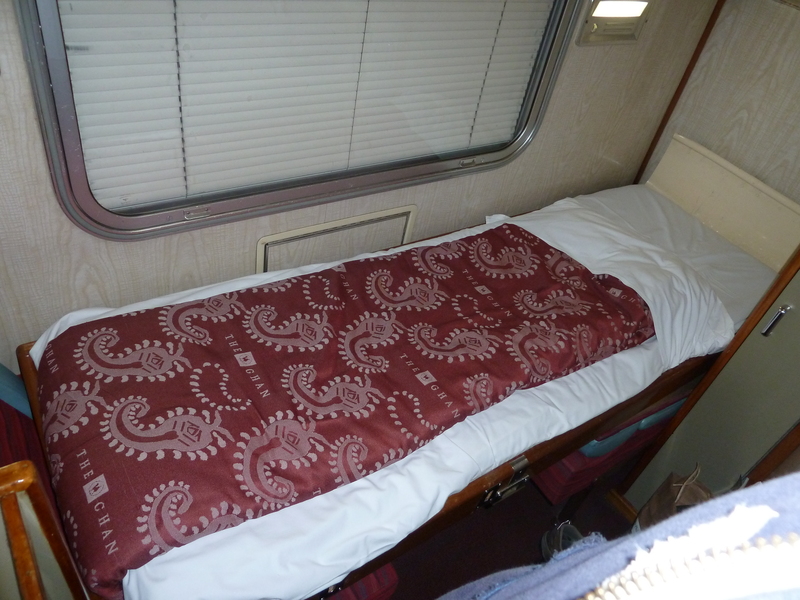 I think back to my experiences in some of the ‘second class’ carriages across Russia and Mongolia. 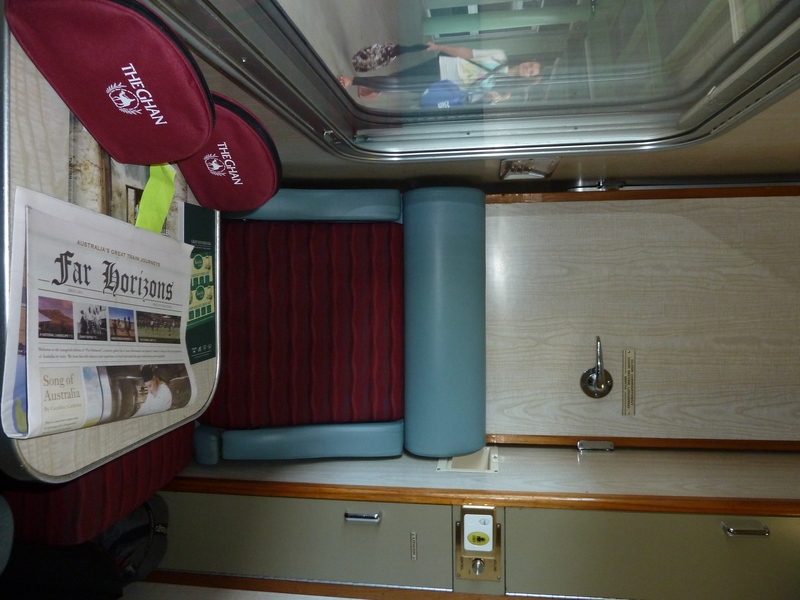 This is the ‘basic’ service on this train, yet compared to my times on the trans-Siberian, it was like a palace. Huge comfortable chairs, storage space, a clever little sink that folds down, smart red carpets and power sockets. Relaxing music is being piped into the room thanks to an individual radio in the ceiling, there are towels neatly folded up on the side, and on my table, a beautiful red toiletries bag, complete with shampoo, conditioner, earplugs and soap. 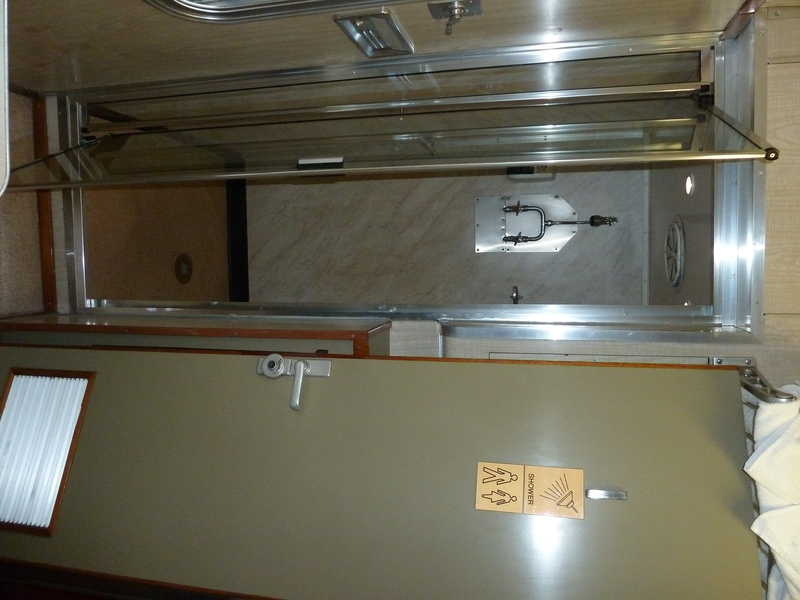 A proper shower on a train – and yes, you can watch the world go by when you’re in it! As I marvelled at the shower, I immediately thought back to my times on the trans-Siberian through the depths of Russia, and of my long stint lasting four days and four nights on one train without getting off. What I would have done for a shower and facilities like this over there. Somehow, I don’t think my squash ball improvised plug, that came oh so handy to block the sinks back then, will be needed on here. With departure imminent, there is an announcement for staff to remove all the flags and markers from outside the train. I settled down into my seat, wondering if anyone else would be sharing the cabin with me. Nobody else arrived – I’ve got it to myself. Just a couple of minutes after the scheduled departure time of 12.20pm, I could feel a slight vibration, and then movement. Outside, friends and family were waving to loved ones as they disappeared down the tracks. Workmen, who just a few minutes ago were loading bags and suitcases, leaned on the steering wheels of their carts and watched as the mammoth train began to slip out of the station. Adelaide began to move past my window ever faster, the train being waved on by many who had made a special trip out to watch its departure. 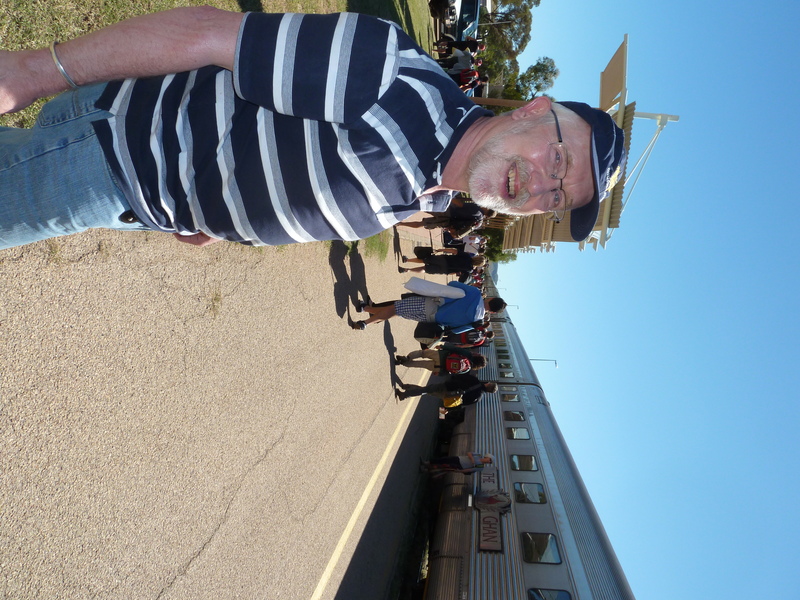 The Ghan is held in such high regard, it wasn’t just your typical train spotters that had turned out to jot a number down in a pad, or take a photo as it passed. As we inched our way over the points and crossings in the city, a young boy on his father’s shoulders waved at every passing carriage. 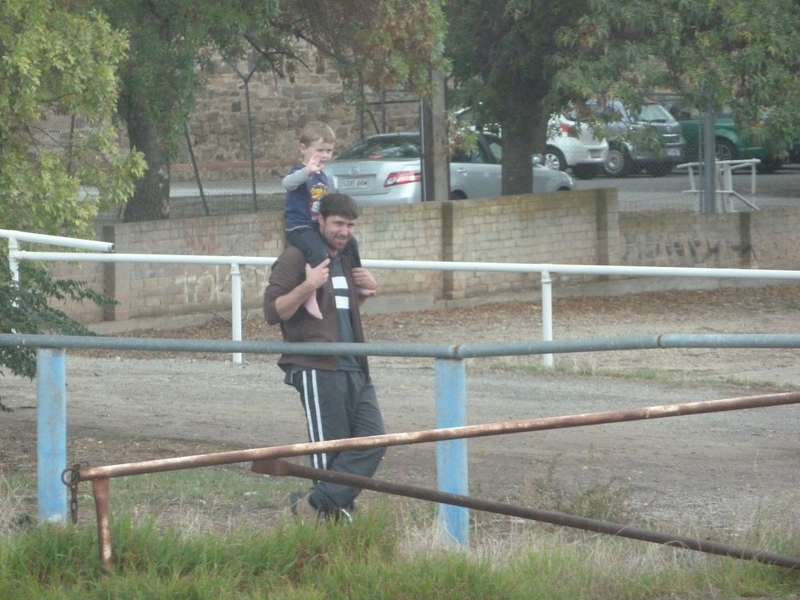 It must have been something to see the passengers waving back, and I joined them, giving the young lad a big wave back. His father pointed at me and smiled. Further along, a couple walking their dog had stopped by the fence to watch the departing spectacle. Even their pets were standing to attention. This wasn’t just your average 10am departure to Kings Cross like you or I are used to. This was special. This was a journey that even now, even for those who live here, captures the imagination. We were not just passengers getting from A to B – we were being waved off as if we were explorers, early adventurers setting off on a ship into the unknown. Soon, the cityscape of Adelaide and its suburbs began to change into open fields and plains, peppered with gum trees and sheep. 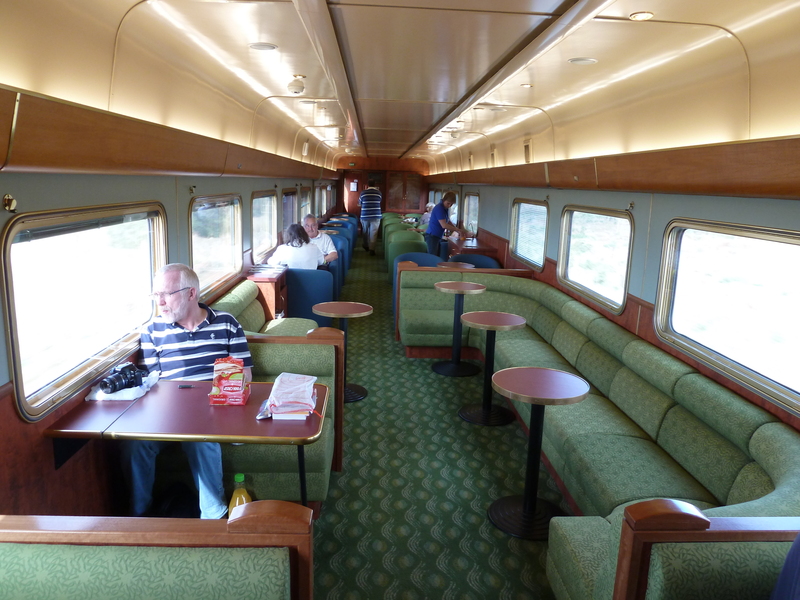 I went for a wander through the carriage and into the lounge area, full of similarly-minded travellers just getting stuck into a book, sipping a coffee or with their noses pressed against the window, watching as the Australian landscape unfurled in front of them. I sent a text to my new friends Dan and Laura, a few carriages away in the reclining seat section, and asked how it was back there. “Hey Phil, its really good! Can’t believe how much room we have! What’s yours like?” came the reply. I sent a cheeky one back. “Just tucking into some caviar with a personal hostess fanning me. Heaven knows what Gold and Platinum class must be like.” I pressed send, and laughed to myself as I imagined what the reaction would be just a few dozen metres behind me. I quickly sent a follow-up, telling them about my cabin and that I’d meet up with them later. “Sounds quality mate! It’s even good back here in the cheap seats. Will let you know when we venture forward later,” came the reply. “Careful of the guards if you venture forwards from steerage – meaner than those on the Titanic,” I quickly sent back, putting another cheeky smile on my face. 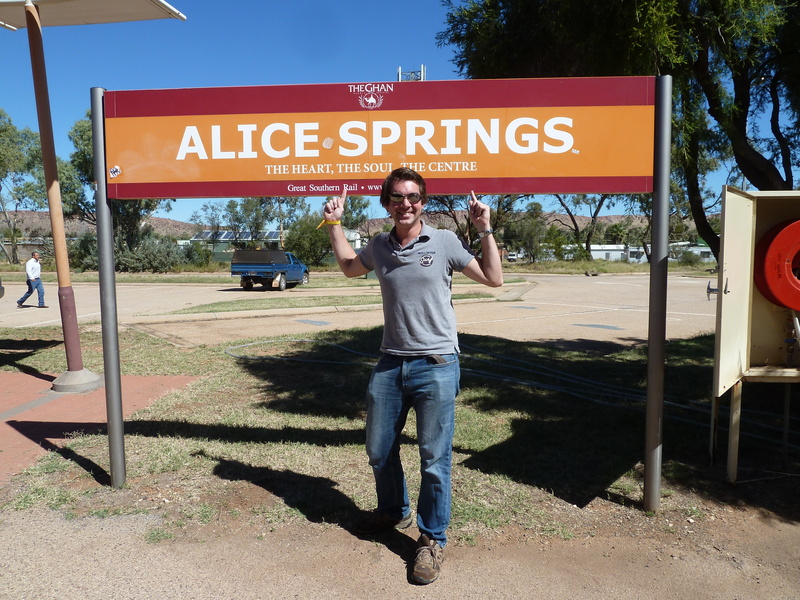 I can see us becoming good friends – we’re already planning to spend time in Alice Springs and around Ayers Rock together, and we’ve all got similar interests and a sense of humour. I’m looking forward to dinner with them later. Outside, there’s definitely a changing colour to the landscape, the pale green of dried grass and fields is being interspersed with a browny orange soil. 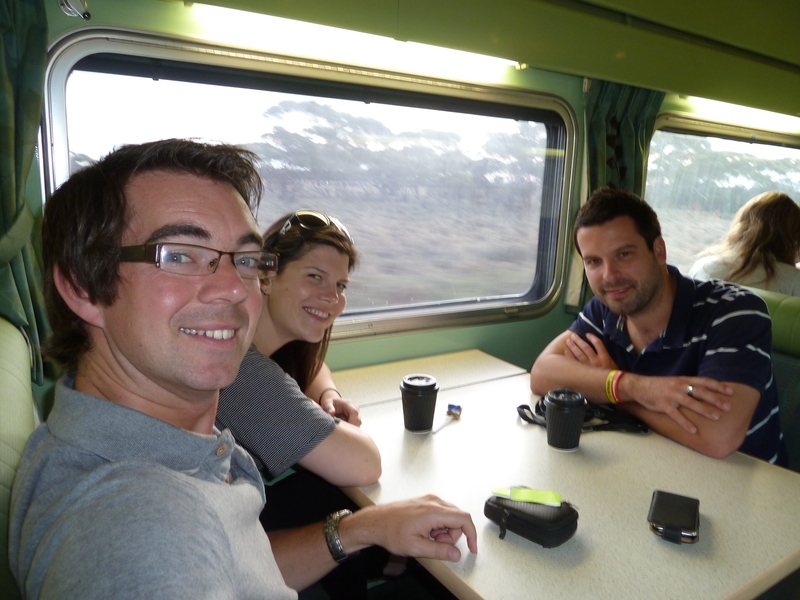 I lost phone signal, so decided to have a wander through the train to find Dan and Laura. It didn’t take me long, they’re only a couple of carriages back, and I sat with them over a coffee, watching the world go by and chatting about our travels. Dan told me how he’d been working on a syrup mixing plant at a Schweppes factory in the south, making Pepsi and Solo. He explained how he was earning more money pouring citric acid into a vat than what he was ever earning as a teacher at an inner city school back home. Somehow it doesn’t seem quite right, but I’ve met a surprising number of people with similar stories, of giving up careers they have worked so hard for because they realised they can earn more money by doing something that needs far less in the way of skills. Obviously, with travelling, most save for a few months and then use that cash for the next adventure, but it does explain why there are so many older people on the backpacking circuit, out in Australia having learned they can live a comfortable life on their travels, yet still save money. 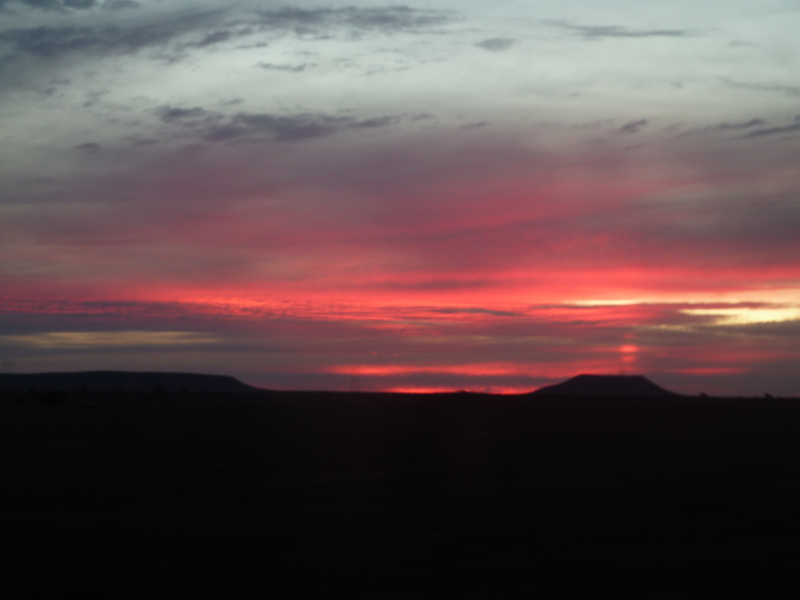 As the sun set, the sky turned a beautiful shade of fuchsia, casting an array of bright colours across the clouds over the plains. I settled in the lounge carriage with a complimentary coffee, and splashed out on a Kit Kat. It has a very relaxed feel about it, with comfortable bucket chairs and sofas to sink into. I spent the evening in the Matilda restaurant car, talking to fellow travellers who were all enjoying the experience just as much as me. They included Cathy, a 60 year old woman from New Zealand who moved to Australia in the 1990s, and is living proof you are never too old for backpacking. She’s currently taking a year-long tour of the country with her beloved car, which she occasionally waves to on the Motorail carriage as the front of the long train negotiates a bend ahead, briefly becoming visible through the window. “I love just meeting so many different people, of different ages, from all around the world,” she beams, talking to us all like the friends we already are, if only for a few hours. By 11pm, most of the train had gone to bed, and I made my way through the curvy corridor to my room, unhitched the bed from the wall and laid it down. I looked out of the window at the blackness outside, only illuminated by a feint light shining out from the shower cubicle a few metres in front of me. 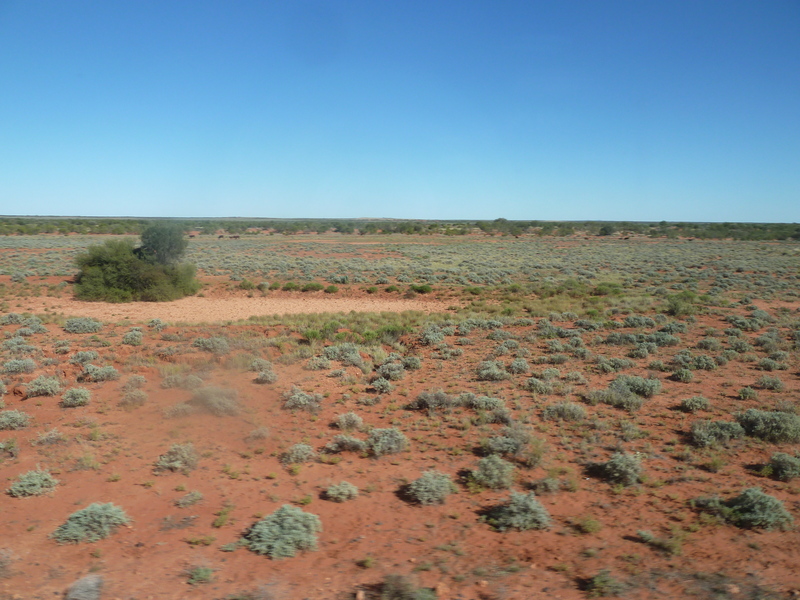 I closed my eyes, and it wasn’t long before the gentle rocking of the train worked its magic, sending me into a deep sleep as we made our way north through the outback. The next morning, an announcement for breakfast service woke me. I slowly opened the blind. Outside, the landscape had changed – a repetitive scene of bushes and small trees rolling by my window, the greenery contrasting with the deep red sand which stretches from the tracks below, far and beyond the horizon. This is the outback, Australia’s red centre. I relaxed with a coffee and began talking to Paul, a skin cancer specialist from Hamburg in Germany. He’s in Australia for a conference in Brisbane, but decided to tick some things off his bucket list before getting down to work in a few weeks time. “Going by train gives an entirely different perspective, doesn’t it,” he said, watching as a dry river bed passes beneath us. He’s well travelled, having backpacked through southeast Asia back in the 70s, and a keen photographer. Our first conversation actually began thanks to me finding out the door windows between carriages offer better photographs of the world outside thanks to a single glass pane cutting down on reflections. I couldn’t agree more – its one of the reasons why, with time on my side, I decided to make most of my way Down Under by keeping my feet on the ground. There are some parts where you have to fly, but on the whole, making your way over vast distances by land only gives more of an adventure, more of an experience. And it’s a social experience too, wandering through the carriages to meet friends along the way. There are no seatbelt signs here to keep you in your seat! Another brilliant touch is the regular updates of what we are seeing outside the window from the train manager, with informative and interesting anecdotes about sites and scenery along the way. Its all broadcast via the onboard radio, giving the journey the feel of a tour more than just a way of getting from point to point in Australia. 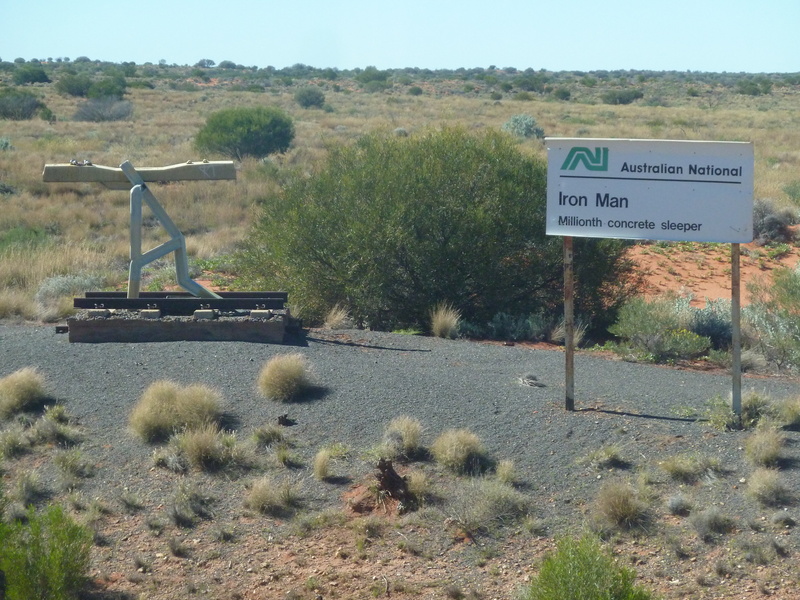 At one point, he came onto the radio to explain how the drivers were slowing the train down so we could see a unique statue at the side of the track, that of Iron Man, a figure holding up the one millionth concrete sleeper. It was erected as a tribute to the work of those who built this huge line, which was actually re-routed in 1980 to avoid flooding problems around 100km to the east which had plagued the service. We had plenty of time to take photos, before the engine powered on and we accelerated back to normal speed. 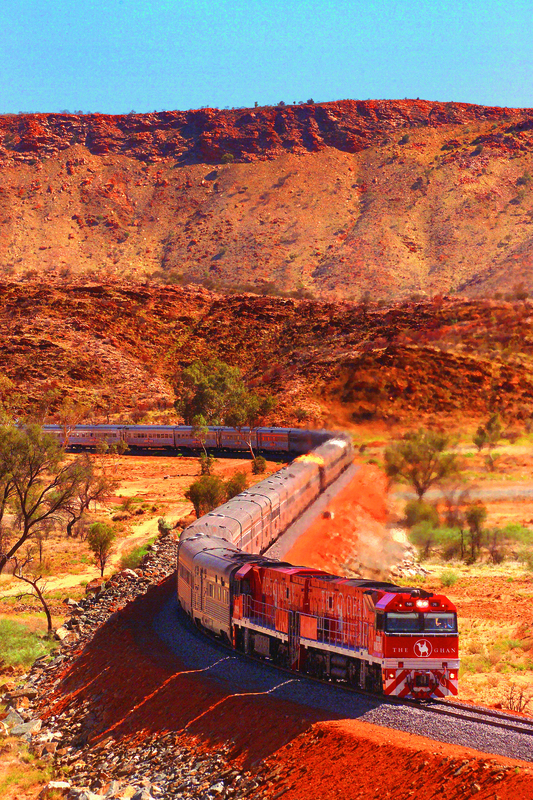 With the kilometre posts alongside the track knocking on through 1,500km, we are just a few minutes away from Alice Springs, the magnificent Macdonnell Ranges looming ever closer. A Qantas jet plane flies overhead, the first reminder of civilization for a good few hours, with only desert and outback bush to look at for most of the morning. 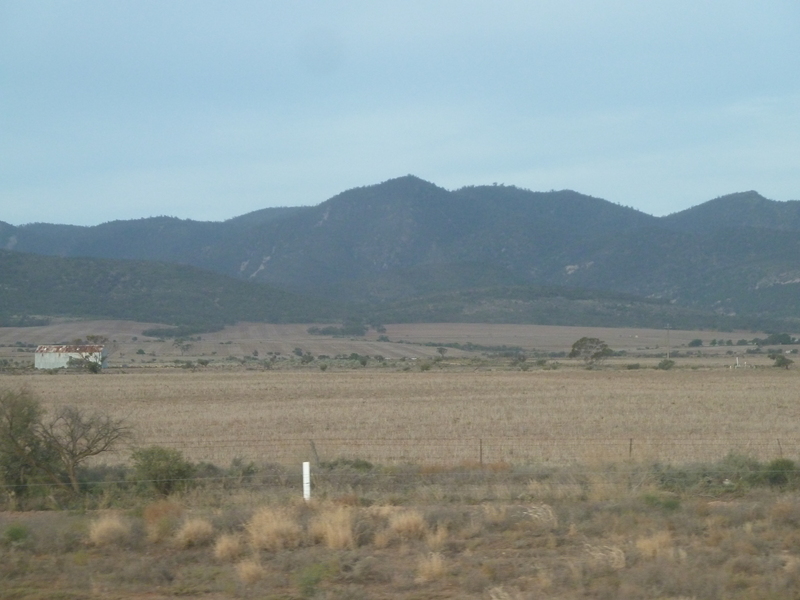 As we creep around a gentle bend, the Stuart Highway comes into view, full of cars and road trains making as equally an impressive trans-continental journey. 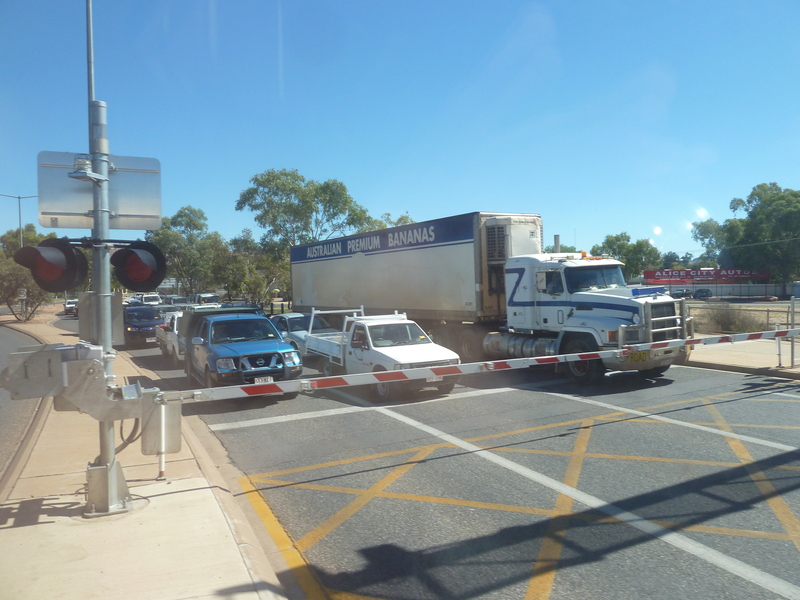 The length of the train brings the town to a standstill as carriage after carriage rolls across the railroad crossing and alongside the platform, the halfway point for this train’s epic journey. For me, it offers a week-long stay in the outback, a chance to visit the world famous sights of Uluru, the Olgas, Kings Canyon and the terracotta red sands of the Northern Territory. While I’m doing all that, this very train will make its way on to Darwin, turn around, go all the way back to Adelaide, and then come back to pick me up in exactly a week. 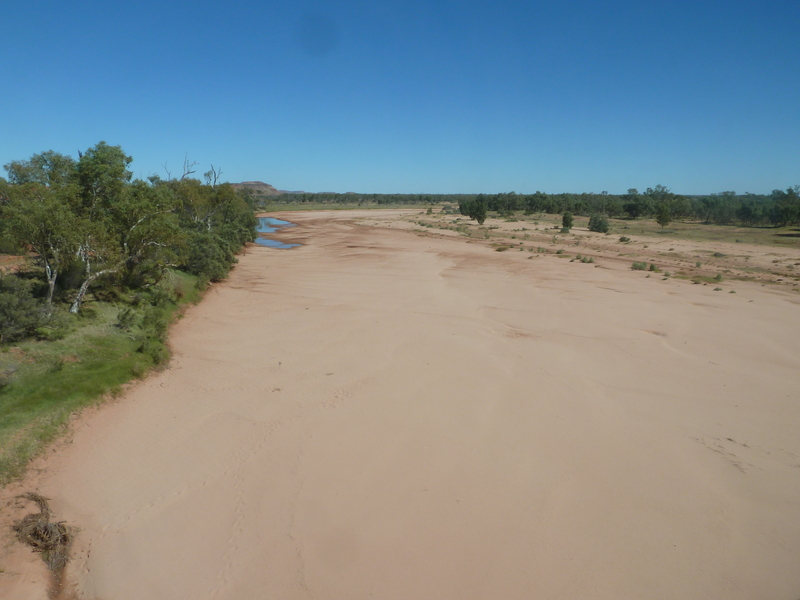 Arrival in The Alice – and its warm again! As I step off into the warm sunshine, Paul comes up to me. “I forgot to ask, where in England are you from?” he said, camera over his shoulder. “Ah, it’s a little town on the east coast, you’ve probably never heard of it. Grimsby.” I replied. He stepped back, gasped and smiled, gently shaking his head. The irony is that it’s partly down to Grimsby why I’m here – to visit Neil, a good friend from years back who I used to work with in the town’s Pizza Hut restaurant. 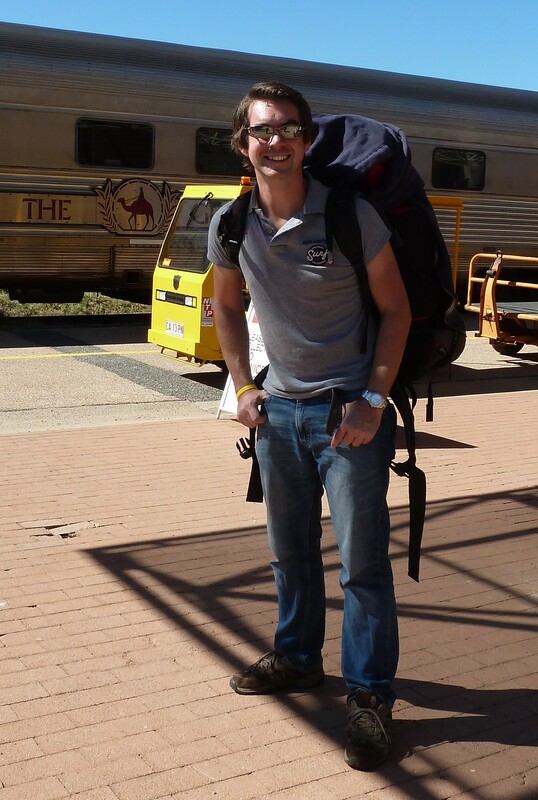 I grabbed my backpack, bid farewell to the Ghan for now, and set off with Dan and Laura into the town centre and to their hostel, Toddys, which will be my home for a few hours until Neil finishes work later in the afternoon. The last time we saw each other, I was 18, driving a gold Fiat Panda, had my university days ahead of me and had no idea how or what I would do to get into my journalism career. And when we said goodbye back then, how could anyone predict our next handshake would be on the other side of the world, and quite literally in the middle of nowhere. We’ve got almost 13 years-worth of catching up ahead. This week should be fun! 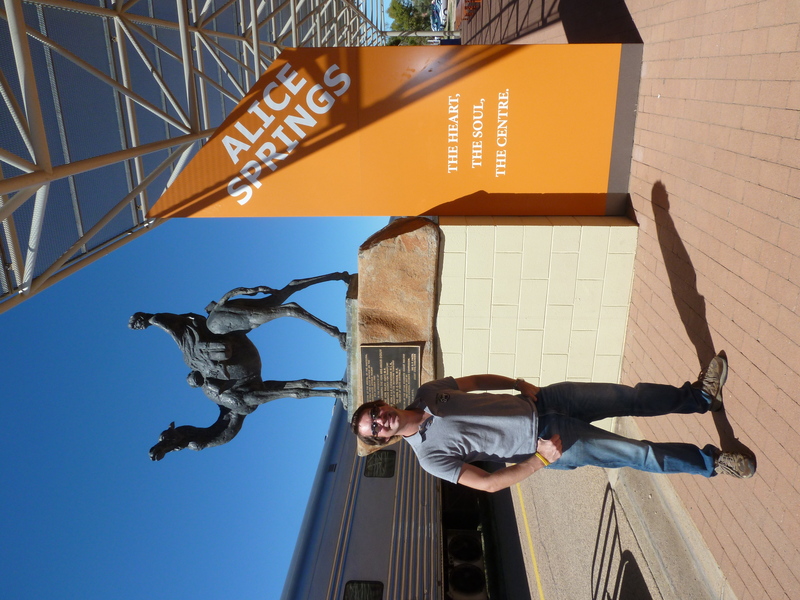 This entry was posted in Australia, Backpacking, Travel and tagged adelaide, adelaide to alice springs, adelaide to darwin, adventure, afishoutofgrimsby, alice springs, australia, backpacking, desert, famous train, great southern rail, great southern railway, phillip norton, red centre, the ghan, train, trains, trans-siberian, travel, travelling by afishoutofgrimsby. Bookmark the permalink. I’m really jealous of your trip. In fact just a week past Tuesday I was on a qantas plane from Melbourne to Hong Kong looking down on the red centre and wishing I had the time to be doing the train journey. While down under this time I did follow the Overland Track in Tasmania from Cradle Mountain to Lake St Clair. 85km and 6 days – completely brilliant. I was in Alice more than 8 years ago and remember a fabulous Thai restaurant in a smart hotel. I’m sure you’ll find somewhere great… Enjoy your adventure! Great to hear back so quickly. I’m really good-three weeks off was fantastic; I can’t imagine settling back into work after 7 months but I know everyone does so you will too. Maybe I’ll do a gap year or gap half year at some point! I’ll carry on reading your blog enviously in the meantime!